Unless you're one of those people that had their Christmas shopping all done and dusted by mid July, you might be in need a bit of inspiration to get you going, and today's post is here to do just that. I've compiled a gift guide to suit every budget, from the inexpensive to the super indulgent and luxury. I hope you find something here that will neither help you find the perfect gift or inspire you towards your own perfect Christmas gift that you'd like to receive. 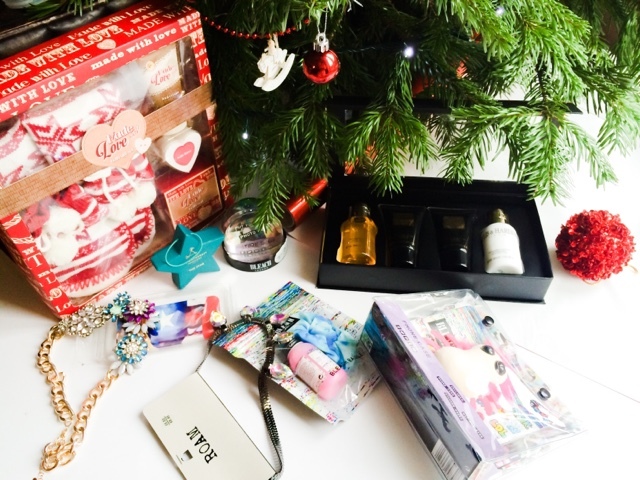 Today's post is focused on the more inexpensive gifts and stocking fillers.. This cute tree decoration contains one of their best sellers - the bath and shower oil. These oils are fantastic, they smell a-mazing and full the bathroom and even the whole house with their essential oils and relaxing properties. I think this is great as a secret Santa gift, for anyone that needs a bit more 'me' time. Lets face it we could all do with a bit more of that! I always think smellies are a fail safe idea for men. The chances are they neven buy them for themselves and suit any age range. This one for Baylis and Harding contains everything a man would need to have them smelling fresh and looking great. The set includes, two shower gels, a face wash and after shave balm. This gift would suit men, women, teenagers and a great stocking filler. You can personalise it with any photo's you like and even make a collage of all their favourite pictures. Bleach London have some fantastic gifts that would be perfect for teenagers and sticking fillers. The Bleach Bauble contains one of their besting selling temporary colours in a choice of two shades as well as a retro scrunchie. For anyone that likes taking pictures this snow-globe allows you to customise it with any picture you want, and once shaken creates a holographic heart snow scene. These are a fab gift for anyone into fashion and even better -you don't have to know their size! Statement jewellery is all in at the moment and many places have a wide selection to choose from. You can spend as little as £5.00 all the way up to £20+, so you're bound to find a piece that's in your price range. These are from New Look and I think they look a lot more expensive than what they actually were. Who doesn't love new slippers at Christmas? There's nothing like popping on a new pair Christmas morning, and that cushion foamy feeling of walking on air that they have when they're brand new. These are a great find, at only £10 you get the bootie cosy slippers and some foot/bath pamper time treats that I think would be perfect for women of all ages. This is a super cute gift with a Phone Case, Keyring and fun stickers that would please any youngster who is into their hair and looks. Have you found any stocking filler ideas?